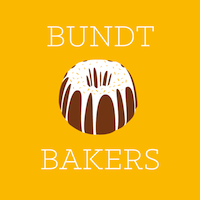 Welcome to the May 2017 reveal day for Bundt Bakers! This month Felice from All That's Left are the Crumbs invited us to bake up something for Father's Day - for any of the special men in our life. But if I do share - I hope he thinks as much of this recipe as I do. 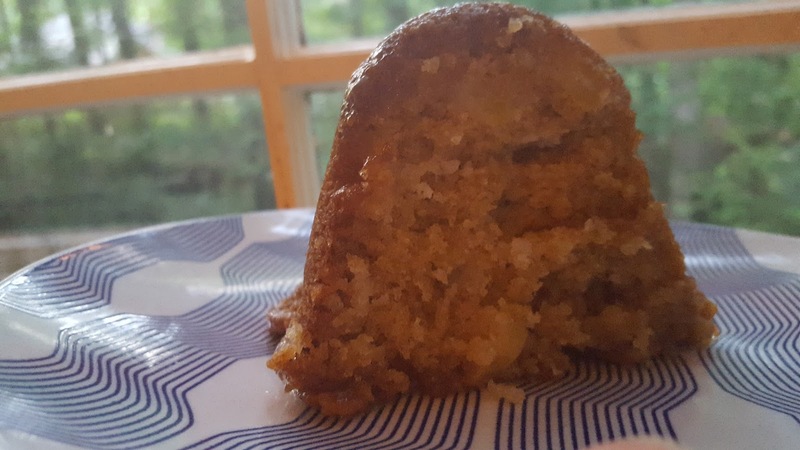 The cake is so incredibly soft and moist, but holds together well, with little tender bits of apple dispersed throughout. 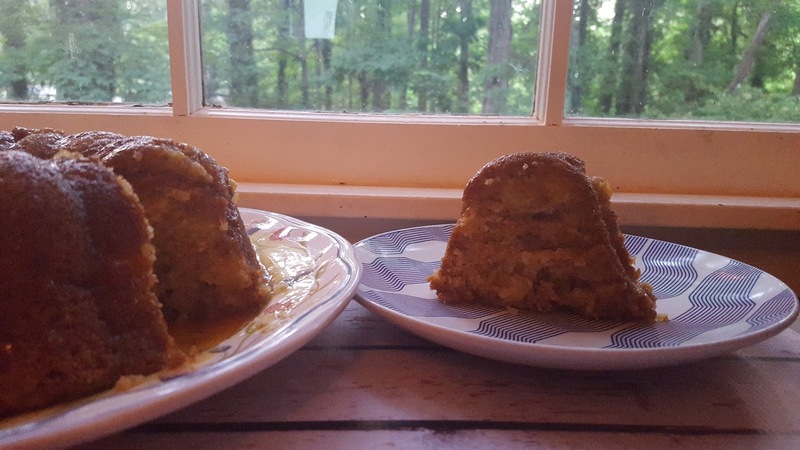 Just a touch of sweetness and cinnamon, and then bam that gooey caramel glaze that soaks into the warm cake. The only thing I did differently from the original recipe is leave out the walnut, on request. I think this is a really delicious recipe that I would happily make again. Creating the sauce was a bit of a science experiment - watching it foam up thanks to the baking soda and turn from a soft yellow buttery color to a light brown caramel color. I am generally not a huge fan of glazes and frostings, but it complements the apple cake well and is a lovely addition! Preheat the oven to 325 degrees F. Thoroughly grease a 10-inch Bundt pan with Crisco and lightly flour it. With an electric mixer, beat the 2 cups sugar, eggs, and oil until smooth. Add the orange juice and vanilla; mix well. Sift together the flour, salt, 1 teaspoon baking soda, and cinnamon. Add the flour mixture to the sugar mixture and beat well. Stir in the walnuts (if using) and apples, until blended. Pour the batter into the prepared pan. Bake for 60-90 minutes, or a toothpick inserted into the center comes out clean. Remove the cake from the oven, let it cool in the pan for 15 minutes, then turn out onto a cake plate. Combine the 6 tablespoons butter, 3/4 cup sugar, 1/2 teaspoon baking soda, and buttermilk in a large saucepan and bring to a low boil. Boil the mixture for 5 to 10 minutes, until it thickens slightly and begins to turn light brown. Take off the heat. (It may foam up quite a bit while you're simmering, just turn the heat down slowly as needed to keep it from over flowing, and cooking too quickly). Poke holes in the warm cake with a fork - all over the top and along the sides (gently). Allow glaze to cool slightly, then pour over the prepared cake, allow it to soak in. Set cake aside to complete cooling. Store the cake in an airtight cake carrier in the refrigerator for up to 2 weeks. 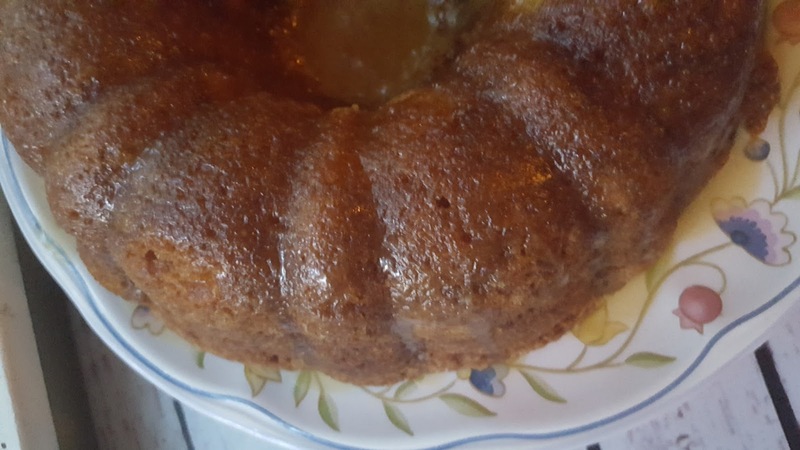 Wow, the combination of apples and cinnamon, and the fact that this cake looks so moist from that beautiful caramel glaze would definitely have me asking for a second slice. I love, love, love apple cakes.....can't wait to try this one. Ohh la la...yummy yummy! I love that you left the nuts out too, which I often have to do since I live with someone who is allergic. Apples and caramel - those are such a good combination. Not so long ago, I find out that caramel with a bit of coffee powder is the taste I love so much, so I am ready to prepare this recipe with this small change. This little gem makes my mouth water. Yummy! Apples and caramel are always a winning combination. This cake looks like so juicy. I want this for breakfast, lunch, and dinner...it sounds amazing!